Raksha Bandhan, a festival to celebrate love & duty between brothers and sisters on the full moon day of the Hindu month of Shravana in India.On this special occasion, the sister performs Rakhi ceremony by tying thread of Pure Love, Trust and Protection on the wrist of his brother then prays to express her love and wish for the well being of a brother. In return, the brother gives a promise to her sister to protect her from all difficulties. Every girl likes to dress up and looks beautiful with the stylish outfit on this Rakhi Day. If you're a little bit confused about "what to choose? "& "How you look extraordinary in Indian ethnic wear for Rakshabandhan Celebration? ", you are at the right place. Keep continue to read that will give an idea about the selection of suits for Raksha Bandhan 2017. Salwar suit is one of the loved and comfortable Indian ethnic wears globally & even it's perfect for events/functions also. It is very common since ages to follow Bollywood actress attires and styles. The elegance of it's designed is totally different than other. Every suit of an artist is being seriously studied & designed innovatively by fashion designers and gets influenced by their vivid styles.The way they are designed differently for different occasions is fascinating. Fashion and pattern will be at the peak of your splendor the moment you attire this brown art silk Readymade Anarkali suit. It has been beautifully designed with embroidered, Kasab and lace work. It doesn’t matter if you are small or broad, tall or short, off-shoulder salwar will suit you anyway. It’s just one of those kinds of attires which are perfect for every body type. If you have broad shoulders, pair your off-shoulder blouse with a bottom that adds volume and you are good to go. 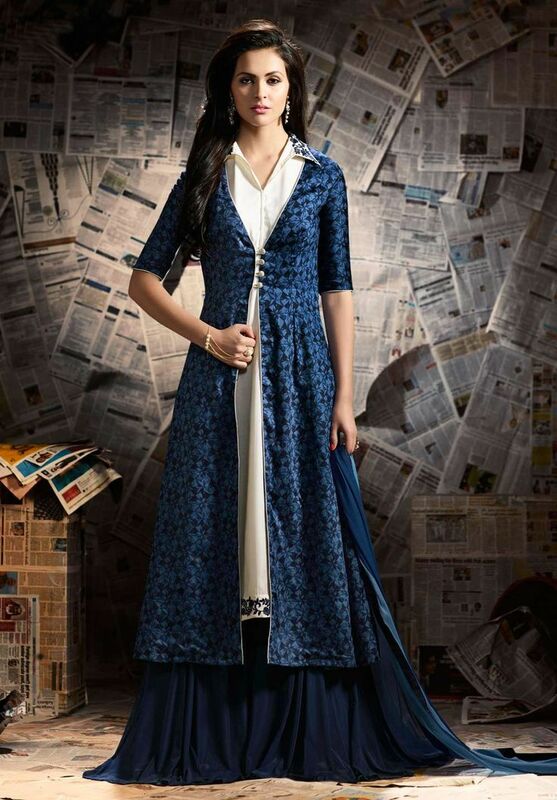 In the world of fashion, designers are constantly coming up with innovative and stylish ethnic wear combining the Indian and Western Styles.These type of patterns like Indo Western Anarkali Suit are designed for those who want to be in touch with ethnic roots and experiments with new style. This style becomes more popular in international fashionistas because of its elegance and versatility appearance. A pant style salwar suit is normally worn with a thin style gasp salwar, which is something in the middle of the puffed salwar and the churidar style salwar. It usually has a loose fitting near the ankles.The kurta could be either long or short contingent upon the decision of the wearer.Pant salwar suit looks very elegant and smart on women of all figure types.The brownish red ankle-length suit is a combination of Indo Western Top and Ankle length pant which gives you enrich look for Rakhi Celebration. You can visit our Indian Ethnic Wear Website to get the latest Raksha Bandhan Collections. Shop now and get a benefit of the exciting deal with Worldwide Free Shipping.